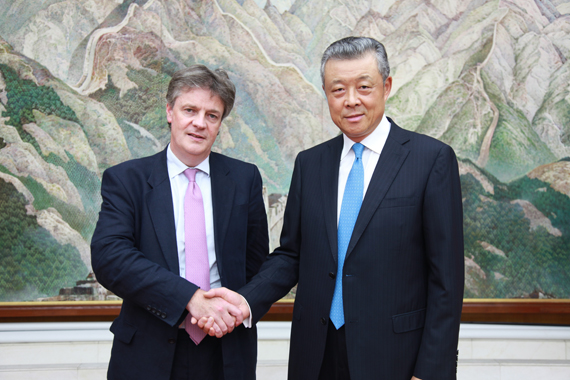 On Sep 29, 2017, Ambassador Liu Xiaoming met with Jonathan Hill, former European Commissioner for Financial Stability, Financial Services and Capital Markets Union and former leader of House of Lords at the Embassy and exchanged views with his guest on China-UK relations, Brexit, European situation and other issues. Ambassador Liu noted that this year marks the 45th anniversary of China-UK ambassadorial relations, and it is also a year for consolidating the "Golden Era" of China-UK ties. 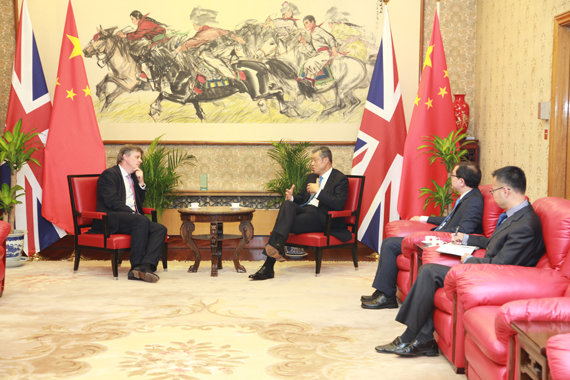 With the joint efforts of both sides, China-UK exchanges and cooperation in various fields has been very productive. They are fine examples of China's relations with major western countries. China is following the progress of the negotiation between the UK and European Union, hoping that the two sides could come to a win-win agreement. Hill said that China and the UK share common interests in supporting economic globalization and advocating trade liberalization. The UK has sound business environment, considerable strength in education, law and language, and broader prospects for development after Brexit. The two sides should seize the opportunities to work for more practical results in the economic and trade cooperation between China and the UK and to take the China-UK relations to a new high.